When a parcel arrived recently my daughter got very excited as the sender was named Versaci-I think she misread it as Versace and thought Mum had splashed out on couture. Of course it was something so much more interesting. Somewhat obsessed with vintage zippers AmaliaVersaci uses them as a base material for her jewelry. I bought two zipper chains- one for a present, one for myself and love it. The perfect weight and colors it is one of those pieces where only after closer examination you realize the chain links are in fact zip sliders. She also fashions these into earrings in a very successful way. Gift boxed and with fast shipping from NJ to Auckland I can't fault this inventive recycled jewelery. Hey trix...I cant believe that forger on Etsy...but aren't they HORRIBLE!!! 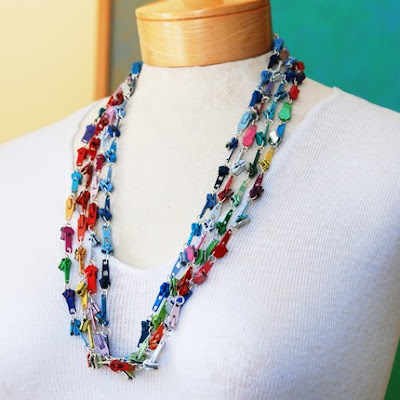 I meant the forgories of your work, not these fabulous zipper necklaces!